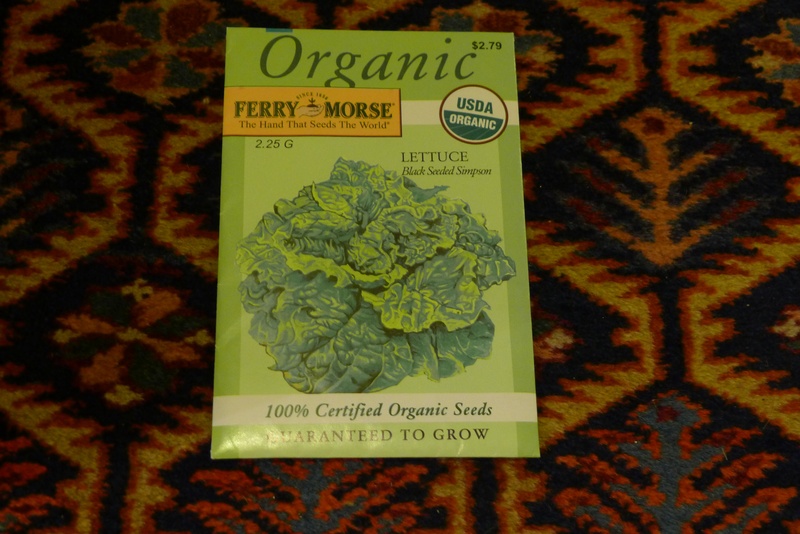 One of the major things I plan on changing about the Vegetable Garden for next year is the use of organic or sustainably produced seed, I have not stopped thinking about this and reading up on it since I got back from the U.S. 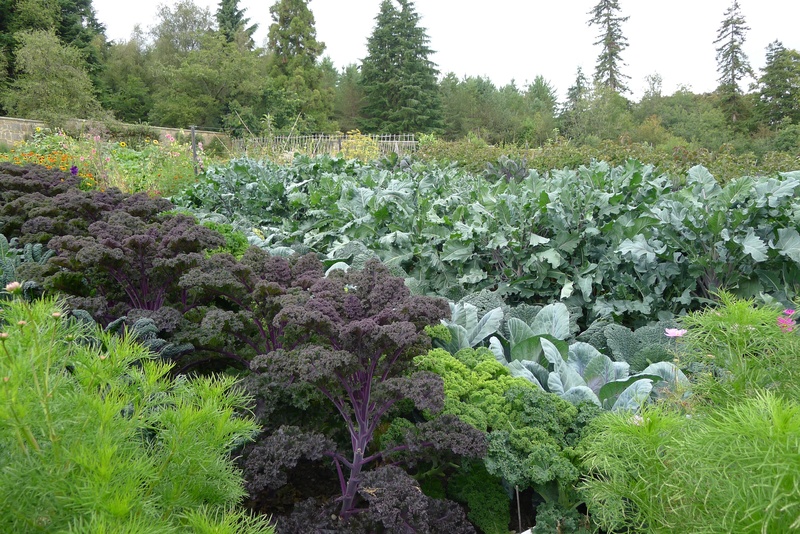 The talk that Margaret Roach gave has made me question how I want the seed that we grow here at Great Dixter produced. 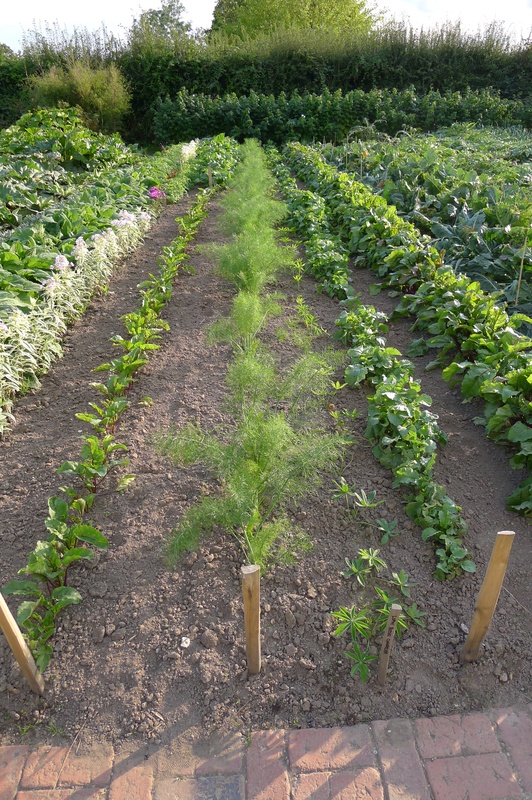 It seems that seed produces do not have the same tight controls on the use of chemicals as those of us do who produce food, also there is a lot of seed production is areas of the world where a lot of water is needed to grow the plants to produce seed. We need to buy from people who use land stewardship practices, it really is something we all need to think about. The Artichoke slips that we took in the spring are now in fill flow with flower buds, that is why Christopher liked to have the plants at different stages, this way he could have an Artichoke almost everyday for the summer, and this rain we have just had has helped a lot in the development of buds, I hope we can sell all that we can produce. These slips will be split in the spring of 2016, it does seem a rather long way off. 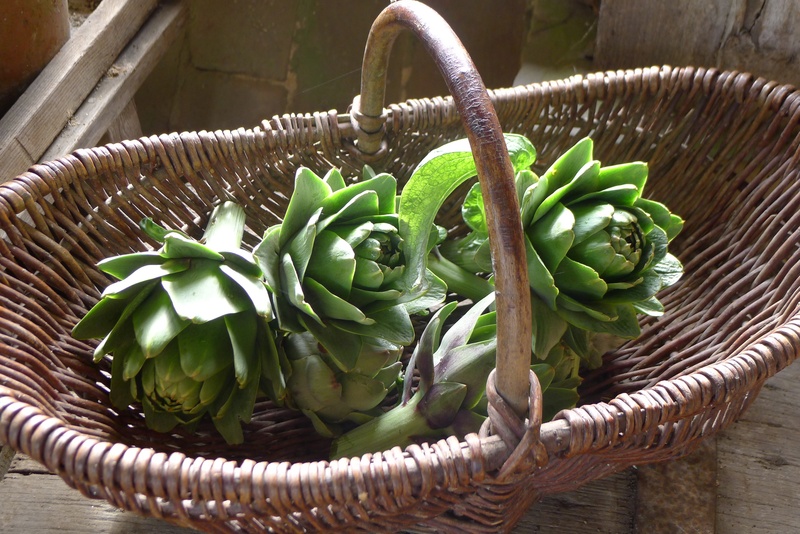 It will not be too long before I put straw around the Artichoke to help them get through the winter. It is great to have two bags of Tomato in the freezer ready for the apples to be ripe. 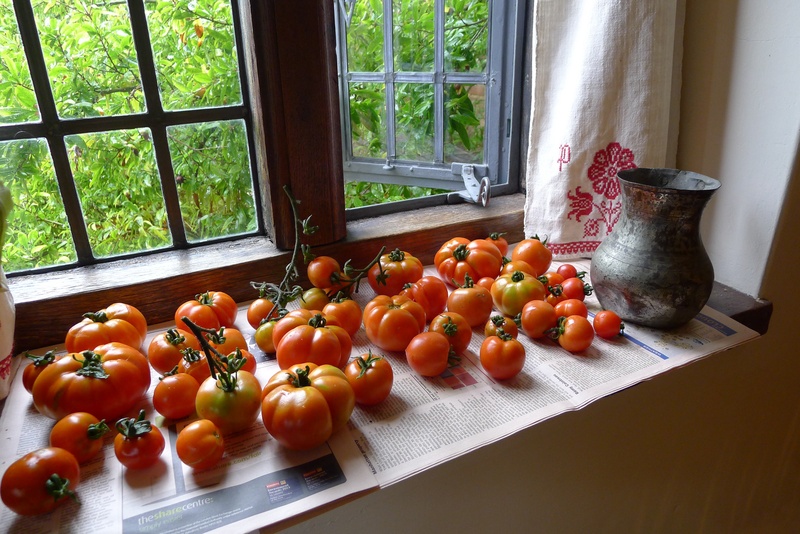 Not all the Tomatoes that we picked where ripe so I have put the ones that need more colour on the window sill of the Servants Hall, they will get the midday sun which will be enough for them to get colour in a few days, it is really something that needs to be looked at each day, it is easy to leave it for a few day and to go into find a mess. They are picked at different stages so become ripe at different points. We have had 40.9mm of rain in the past 48 hours, this is a very good thing in general for the Vegetable Garden but not great for the crop of Tomatoes, rain at this time of the year after a time of dry will make them split. 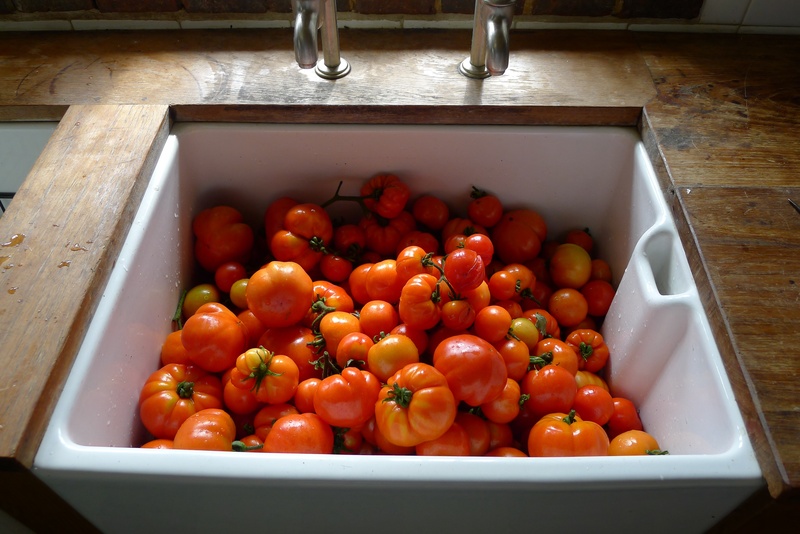 The only thing to do is pick everything that is ripe, and get it ready to freeze, I put them into hot water to get the skin off then cut them up and put them in 6lb freezer bag lots till Mrs Nextdoors apples are ripe to make Ripe Tomato Chutney. 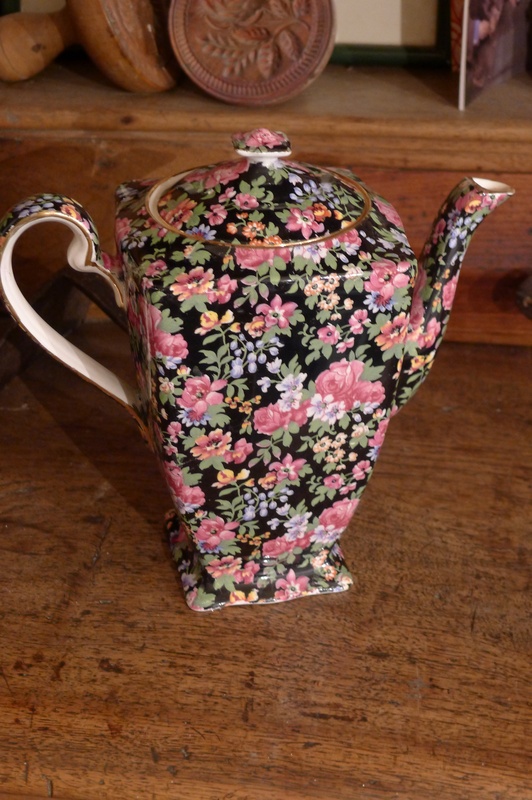 A new collection may have started in my life, Linda who came to stay for few days carried this Royal Winton Coffee Pot with her from the U.S, I am so happy to have it, my next door neighbour as a child Sue was a collector, and maybe still is, a question to ask. Well I now have something of my own, I love this kind of thing because it reminds me what a friend once said, because we are out in the soil all day we should have the good things in life in the house, great china to eat off, good bath oil to end a day of working the land in, and a great nights sleep in thick cotton,the good things in life. I was taken to lunch today by my friend Linda who is over for a few days. It was not just anywhere for lunch but to Gravetye Manor, not only did we have a great lunch but the chance to have a look around the garden, I think that Tom has produced the best working vegetable gardens in the country, gardens that grow vegetables just for looks and not use them leave me rather cold, Gravetye is not one of these, the fruit and vegetables are grown for taste as much as anything, and it tasted good to me. This is the garden that I look to for inspiration. Thomas should get a Gold Star for his thinning out of the Beetroot, not only did Thomas thin it out while I was in the U.S but he also planted out the thinning’s and they have done very well, it is not something that is easy to do, the weather has to be just right for them, not too bright and they need rain on them, Thomas could not have timed it better. I look forward to eating these extras.